Most teens turn sixteen and get the license to drive, but Lil Falcon gets the license to kill demons. Orphaned as a child and raised by an eccentric grandfather, Lil is concerned with surviving high school and is unaware that she’s a Guardian – a being with super powers charged with killing demons and protecting humanity. When she meets Bran, a mysterious boy with amazing abilities, his psi energy unlocks her latent powers. But Bran has a secret that can ruin their growing relationship, and the truth she discovers may destroy everything she believes in unless she finds the right balance between love and sacrifice. Lil is just a normal, average girl – or so she thinks. But shortly after her sixteenth birthday, she starts hearing voices inside her head. Soon she meets Bran and is forced to come to terms with the difficult idea that she is not completely human – she’s a Guardian. Lil thinks Bran is great - well, not at first, but he grows on her. Bran, though, is hiding a big secret, and Lil may lose everything she's gained unless she can find a way to make it right. Awakened was okay, but it wasn’t great. I was not a big fan of the fact that not only is Lil not completely human, but she’s also been sent from another planet to learn how to “blend in.” That took the story a little too far for me, and, though it was an interesting story, I felt that the back cover blurb did not adequately describe the story. I always prefer to know what I’m getting into before reading, and I always feel a little off when the cover art and back cover blurb don't adequately do that. 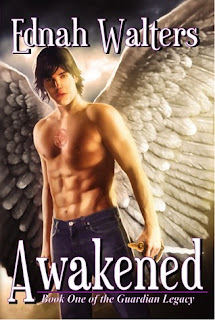 Readers should be aware that the cover is misleading, and this isn’t a straightforward angel story. Back to the story itself: The plot, especially the development of Lil and Bran's relationship, felt somewhat rushed. Maybe it's because I've been lucky enough to read some amazing young adult books lately, but this one just fell flat for me. Some readers may enjoy it, but Awakened just wasn't my style. Watch out for the next book in the series, Betrayed, coming soon!